Ireland will have a new Taoiseach in June after Enda Kenny quit as leader of his party. Mr Kenny stood down from the helm of Fine Gael at an emotionally-charged meeting of party colleagues in Leinster House in Dublin after delaying the announcement for several months. The veteran politician, from Castlebar, Co Mayo, led the party for 15 years and has been at the head of two governments for more than six years. Nominations for the contest to replace him close on Saturday with the successor due to be elected by June 2 and the Dail due to vote in the new leader as taoiseach in the following days. Mr Kenny made his announcement at a brief parliamentary party meeting where some supporters were said to have been visibly upset at his long-awaited plans for departure. One party figure described how Mr Kenny's voice quivered as he finished his address to colleagues before making a swift exit rather than waiting for questions or commendations. Another senior member said: "The body language of some of his loyal supporters said it all, there were a few teary eyes." Mr Kenny was said to have been composed, making the announcement on his own terms. "I would like to stress the huge honour and privilege that it has been for me to lead our party for the past 15 years, in opposition and into government on two successive occasions," Mr Kenny said in a statement. "I thank all our members, past and present, for that privilege." Mr Kenny paid tribute to constituents and supporters in Mayo who he has represented since 1975. He thanked his personal staff and gave a special mention to his wife Fionnuala and their children and extended families "for their understanding of my work, and indeed for accepting the many intrusions of politics into family life in the interest of building our country". Mr Kenny added: "I could not have engaged as I did without that base." The father of the Dail leaves a legacy of steering the Republic out of a crippling recession, albeit with an agenda of austerity. Aside from the economics, his achievements will include gay marriage rights, an apparent determination to stand up to the Vatican and legislating for abortion in limited circumstances. Failures will list his inability to convince the public on water-metering and charges, painful tax hikes, unprecedented homelessness and a myriad of police corruption and negligence crises. 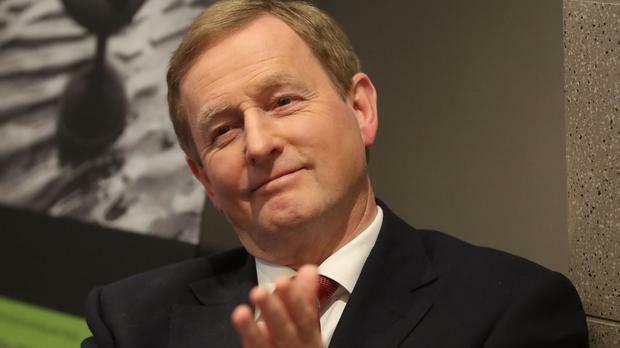 Fine Gael party chairman Martin Heydon described Mr Kenny as a "compassionate, pragmatic and inclusive" leader. "Having inherited a country and an economy that was decimated by mismanagement, Enda's strong leadership and ability to make hard decisions was recognised both at home and abroad and saw our international reputation restored and strengthened," Mr Heydon said. Mr Varadkar, a doctor from Dublin and the favourite for the job, is the first openly gay member of cabinet. In recent weeks his campaign to clamp down on welfare cheats has been fiercely criticised in some quarters, including by a former social welfare inspector, and opponents who questioned the level of fraud in the system. Mr Coveney, from Cork, has also held a number of ministries but faces weekly criticism of his efforts to tackle the country's unprecedented housing and homelessness crisis. He set himself a deadline of the end of June to end the practice of putting up thousands of families who need emergency accommodation in hotels and B&Bs. Other outsiders include Justice Minister Frances Fitzgerald, Education Minister Richard Bruton, who launched a failed bid to oust Mr Kenny back in 2010. The contest is decided by an electoral college that gives the parliamentary party, made up of TDs, senators and MEPs, 65% of the vote. Mr Kenny delayed his resignation on a number of occasions this year. He asked colleagues for time to visit the US for the annual St Patrick's Day celebrations and to meet President Donald Trump, continuing the unique tradition Ireland has of access to the White House every March 17. He stayed on to attend the European Council summit in Brussels at the end of April where the priorities for the Brexit negotiations were agreed. Last week his role on the international stage continued when he held talks with EU chief Brexit negotiator Michel Barnier at Government Buildings in Dublin. Among Mr Kenny's final official overseas engagements will be a two-day trade mission to Chicago and the centenary commemoration of the start of the First World War Battle of Messines.